"Easy Projects has been able to do everything we've wanted it to do"
I evaluated many project software packages and Easy Projects was the easiest to use while still being feature rich. The fact that they have come out with new features every couple months is also amazing. I wish that I could do more customizing with the easy projects reports. We've begun using the BI add-on package to do these reports since they have added that. If I could convince all of the other departments in our company to use this software I would. Controlling our new product commercialization process so that everyone knows what their task is and when it needs to be done. It's given us great transparency into what is going on in each projects. Since we started using this in the engineering group, two other groups have asked about the software and have started using it. "New user - off to a good start"
The program is intuitive to use and very flexible with custom fields. Coming from an older technology, this provides more visibility to our projects' timelines and status with a more graphical interface. The support during evaluation, installation, and implementation has been excellent. We are still getting used to the layout and processes so we are not using the full capabilities of the software yet. While intuitive, it is relatively complex. I would prefer to have an incorporated customer management system in the program. The lack of that requires duplication of effort between our current CMS and Easy Projects. This is a rather intuitive piece of software and the level of support has, thus far, been excellent. The business had evolved from a mostly product based facility to a mostly service based one. Easy Projects provided the flexibility we needed and incorporates a much better time tracking, time budgeting, system. The visibility to deadlines and budget variances will be a major benefit. "Easy Projects in a Marketing Agency Setting"
The best feature of Easy Projects is its flexibility. From the ability to setup projects with any level of nested tasks that is needed, to a reports engine that actually lets us build reports the way we want them. We previously tried one of the competitors products and we strangled by the "do it their way" rigid approach, and are now very pleased with our choice of Easy Projects. EZ Projects is an extremely robust Project Management system, with a very lightweight CRM feature. If they could bring the CRM capabilities up to par it would be a market segment killer! Currently, you can input basic company information and attach it to a project, but there is no facility to input people who work at that company and also attach them to a project. If you want a flexible and powerful project management solution that is backed by knowledgeable people who take a personal interest in supporting you - go with Easy Projects! We needed a project management system that would allow us to manage a diverse set of project types. As an agency, we have time & expense projects, per piece projects, and fixed rate projects. Finding one system to effectively support all has been a challenge. "Its all there, and more. Easy Projects has been integral." Time and productivity tracking at its absolute finest. The ability for any user in the project to see exactly where everyone is at in the project is so valuable. Any time there has ever been a glitch (and there have been like 2 in the last 5 years) the developers are on it RIGHT AWAY. This is so important now days to not have several days of turnover to fix issues that impact productivity hours. They update it a lot, so there's a new slight learning curve once in a while. With every update, however, there is a friendly intro and tutorial/rundown of what happened, so after a day that learning curve is met and the update is such that one is left wondering how they ever went on without it. I work in construction design and technology. We used Easy Projects when there were 3 of us working in a basement. Now we're almost 100 strong with a few offices across the USA with no intent to slow down, only speed up. Easy projects has been with us every step of the way. i work in a schedule driven 'sink or swim' line of work, so easy projects hour tracking and gantt chart abilities, projections, hour and resource tracking are crucial to making assignments and seeing them finished. "A great way to consolidate all your projects, add comments and keep a track on deadlines. " The best part is - via Easy Projects the entire team can keep up with the progress being made on each project. One does not have to spend any time updating each member or sending out emails. The features are highly customizable and email notifications make it very easy to share these projects with those who are not on Easy Project, without having to write emails about the specific project. I also like the reminders that come from Easy Projects if you are past due a deadline. I do find the platform slightly difficult to navigate but with time I got the hang of it. I also feel the look and feel of the website could be updated, making it look more sleek and modern. As of now, it does look slightly dull and could use some good designing. I think it's a good option, one that is worth exploring. I use it to keep track of projects that are assigned to me. It is also a great way to view all the projects assigned in one place with deadlines and level of priority of each project. It helps me to stay organized and also leave comments on each project to keep my boss updated of the progress without bothering her with emails. "Very useful Project Management System with minor improvement areas identified"
Its quick and easier to use and very customizable. It has a very nice look for the Project Manager and has made project management more interactive for our team. The Guest Portal. With recent enhancement it looks much better but very unfortunately all activities you assign to a guest to view in the portal lose their hierarchy structure and this leaves the portal almost unusable for us which is unfortunate. If the Guest Portal could show assign activities in the structure and a default view of the full project for the client - this portal would be incredible! It is a lovely tool. only some minor improvements needed with regard to extracting projects and the guest portal but for a PM it has very nice features. It has made project management more interactive and our team are being far more involved in their projects thus having less chance of missing targets. If the Guest Portal can allow a guest to view the whole project plan and then focus on their assigned activities, easily seeing what headings they fall under; this tool would be unbeatable in the PM market. "User friendly and a way for me to get help on marketing projects." I can get real time answers on where someone is on a project. I also like that easy projects is simple to use, you upload your documents and that allows the administrator to know that someone needs to be assigned the project. I like that it is an efficient way for me to get things done as well. It is just an easy platform that anyone could use and make sense of, would recommend to companies that have different departments/industries that piggyback off each other. I can't drag attachments onto the attachment page. I dislike that sometimes its a bit hard to click into an assigned project to see what has been updated by the person working on it. The amount of emails that we receive seems a bit much, maybe just an email at the start of a project and one with an update and lastly one when the job is complete. I would tell folks who are interested in easy projects that it is user friendly and a site that anyone could navigate despite their knowledge of the web. It's really a way for me to get marketing materials completed since I do not have the necessary tools to get those projects done. The benefits are being able to monitor the projects are they go through the steps on easy projects. The updates are also nice, but i think a start to finish email would suffice. I've realized that using easy projects has also allowed me to focus on the tasks at hand and ensuring that the projects uploaded to the site are taken care of as well. "Director of Donor Relations and Communications"
That there is a system for all parts of a project. However, overall I am not a fan of this platform. I think there is a lot that could be done to improve the platform for all users. It needs to be easier to navigate and more self-explanatory for users. It's interface isn't organized well. It's challenging to know what is due. Additionally, it doesn't make project management easy. For example: My team works with Marketing. Marketing integrated Easy Projects for us. I oversee the vision for a project, but different team members contribute - some social media, some writing copy, others providing mailing lists, etc. In order for me to know what is happening and that parts of a project are submitted on time, it requires me to be assigned that task - which means I must hit "done" BUT I don't want to have to hit done and get a million emails that something is due that I am not responsible for. I simply want to see that my coworker has submitted their part of the project. So, although this is helpful for our marketing team, it's not effective for my team and project management. More consistent communication with our Marketing team - less seems to fall through the cracks now. Being 100% honest, I don't love the platform and would prefer something more like Basecamp. I really struggle with the interface - not a well designed platform or overly user-friendly. "Helped to keep communication lines open between marketing, design, and my department." Organized process flow and email reminders to keep the project front and center. Before the latest redesign, it was more difficult to keep track of items and switch between projects. The redesign helped fix this issue. It is definitely worth taking the time to learn the software since it will more than make up for that time in saving you effort in the long run on your collaborations. This product allowed me as Department Chair to work effectively with my Marketing and Design colleagues to update brochures for our various programs. We were able to communicate back and forth, and the software helped to keep me on task as various responsibilities competed for my attention. The reminders of coming due dates and ability of others to quickly respond to my questions and suggestions within the platform aided our collaboration and resulted in final products that we are all quite happy with. I'm in a different building than the marketing and design folks. The software helped to keep communication current without relying on "phone-tag" back and forth. I like the simplicity of the user interface of this software. It's simple to use and is still packed with a lot of features. Some of the message posting features don't work the way I would like. It would be nice to have record of who received the message. And I think a message should always get sent, regardless of the status of the task. I also wish that documents could be modified without downloading and re-uploading. Highly recommended project management tool. The EP support team will help in any way needed to get you up and running. We use Easy Projects for IT projects within an Insurance company. The collaboration between people on the project and the history of information and communication is very helpful. As a project manager it is nice to be able to review a project and know the current status by looking in EP. "Easy Project Review from Marketer "
I like that Easy Projects allow us to have our project management and budget management in one program. We previously used one program that was decent for budgeting, but terrible for project management. Originally, Easy Project was just our project management program, and we continued to use a different program for budgeting. After our positive experience with the project management, EZP worked with us to create a custom program that was great for both. The program is also very initiative and our department got the hang of it very quickly. The "steps" for each job hold both our design team and the marketing manager accountable to a schedule that is easily adjustable, which keeps everyone on track. The only complaint I have about Easy Projects is that I sometimes have difficulty finding projects that were completed. The search function doesn't always bring the project up, so I have to go into my records and find the job number and search find it that way. This defeats the purpose of a search function and can be tedious. It is very easy to tell which projects I'm behind in, and what is over due. It's an excellent time management tool, and I can track my projects based on their status. For anyone in a management position, you could also track the status of your employees' jobs with ease and ensure that they are completing projects on schedule. user friendly, easily Customizable, different charts, calendar views, easy reporting, quick creation of projects and tasks, customizable views, customize user roles and many more. its a cloud based tool so we can access it from anywhere. Also they have a outlook plugin where you can manage easy projects. They also have a mobile app which is excellent and this help in tracking task, creating task and most of the things. the first and foremost is tracking the projects is easier. we can also figure out the time it takes, we can find out whether the resource is over burden or they have time to work on other projects etc. time tracking, estimated hours, budgeting and other features that are easy to use. The name of this solution matches the performance of the product. I enjoy the organization aspect of Easy Projects. It helps greatly with keeping track of all my tasks. One thing that I've noticed is that it helps a great deal of our team stay on task and more focused than if they had to keep track of things themselves. I don't like that it's so difficult to find a project that I have already completed. Additionally, if I want to add a task for myself that is just a reminder to do something in the day, I can't figure out how to do it in Easy P to have everything all in one space. If you're looking for an opportunity to keep your employees on task, Easy Projects is the best way to do it. Not only are we able to keep everything organized, but we can also keep track of what projects are behind and promptly reply to maintain operational excellence within the office. Time management - I really enjoy being able to track my tasks and projects so simply. Nice way to see when projects are due. I am able to see the big picture of being able to see the whole process. It is easy to use for basic tasks like marking off when a project is complete. Help is very difficult to use. Several videos are offered but are not organized in a way that is very helpful. It is very difficult to find the help needed. Not very intuitive to use. Make the help screens easier to use. Look at your terminology and structure of help screens from the beginning user perspective, not the software engineer or designer. Or have graduated help screens for different user experience levels or functions. Able to track deadlines. Because multiple departments are responsible for the finished product, it is nice to see where something is along the way. I can see the big picture. "A Robust and Configurable Project Management Solution"
Custom fields allow me to create exactly what I need for managing projects for my team. It's quick and easy to set up a project and assign the entire thing out. If this software had better customer management and a better way to account for project invoicing it would be absolutely perfect. Easy Projects is absolutely the project management software to go with. It's the same price or cheaper than every one of its competitors but it offers far more features and can be easily customized to your specific scenarios. Task Management. Easy Projects allows me to assign tasks and for my team members to stay on top of their assigned workload. No more to-do lists in notebooks and long status meetings. That it is very easy to use. We are not using the full functionality of EP. Until recently, we only used it for tracking internal marketing/graphics projects. We are beginning to use the new image annotation function to route/review proofs. This is something that will save a lot of time, reduce paperwork, and provide an audit trail for accountability. Would like to be able to import projects into templates. Would like a better way to track project budgets and be able to import budget numbers with the rest of the project information. I love it. Be sure to get an overview of all the features - it does so much. We have used it to track marketing and graphics projects for about 5 years. It offers consistency in processes, provides job numbers for easy project tracking, and their staff is great to work with. Really user friendly. Once my account was created, I was able to use it right away. As I am working away from some of my colleagues, it's really helfull. Not everyone in the company uses it. Some dept use other platform - like RedBooth. It would be a lot more convenient for me if I could use one tool that would combine tasks from different platforms. It's really a tool for marketing or sales. I can see it would be useful also for independant worker to manage time on clients project. It's a good tool to manage multi tasks from different sources. Colleagues from the Toronto office used to ask me for translation through email. Managing tasks, deadlines and details was really complicated and some would slip through. It's a lot more convenient for all of us now. "Comprehensive online project management tool"
I have worked with a lot of online project management tools over they years. I have found EasyProjects.net to be a very comprehensive online project management tool. It has all the key functions in a project management tool, i.e. Gantt charts, Kanban, resource scheduling, etc.. , in addition you add customized data fields to projects, tasks, customers, etc. Also has customizable forms for internal or external use where responses can then be imported into projects, tasks, ..They also provide excellent support. The client portal provides a great collaboration platform for projects and tasks. I guess it would be nice if within the client portal, clients could view project Gantt and Calendar views, perhaps have access to certain reports if so authorized. Otherwise, a great collaboration option. In my work, I need to be able to plan and manage project tasks, document work done as well as track time. Also to be able to see potential 'bottlenecks'. EasyProjects has helped with those tasks. "Easy Projects - easy peasy"
There are a lot features I like about EP. Our department builds learning for our field staff. We use the tool to keep our projects on track as much as possible. For me as an admin staff it has helped me keep my tasks top of mind, I would love to add all of my work tasks into the tool. I use it mostly for tracking my time on tasks and to reduce "dropping the ball" as I do not work on the same items everyday. I love how organized my team and I can be with EasyProjects. The layout is great and easy to use. At the moment I do not have any dislikes. This product is easy to use and great for what our company needs to have done. Use every feature that you can! It is great for being organized and easy viewing of what is currently going on in any specific project. Having many of us on my team have to each do different activities - Easy Projects makes it so easy for us each to see what we need to do and complete. "Too clunky with too many limitations and restrictions"
The software is a bit clunky and has a lot of limitations. Once you put projects in or set up fields, it is very difficult to delete them. I have contacted customer support a few times and they keep telling me that I have to go into each project and manually delete them if they have a status or person's name that has been put in incorrectly. We have thousands of projects. There is no bulk delete function. The live chat takes forever to connect, so forget it if you need help immediately. Make sure you set it up correctly in the beginning and be careful about letting people create fields that could cause confusion and headaches later. The software is not very user friendly. "User Interface is not user friendly"
The UI is extremely tough to navigate with no way to flag a project, or tag a person who is required to respond. It is not the best project management tool, there is no calendar visibility of timelines for easy management. The view is vertical so if you own 100 projects and each project has 20 line items you have to scroll down 2000 lines to see all projects, there is no means to categorize or even hide projects that are not priority. We manage cross functional tasks on EZP to make sure everyone knows their deadlines and deliverables for an easy implementation. There are no benefits and managing the project on EZP is very time consuming if you have to hunt for a response or a project. "Wide range of tools, easy to use, sometimes an information overload." I like all the dependencies you can set up for tasks, then being able to view said tasks as part of a burndown or Ghant chart to visually track a projects progress. For folks in management it can be a bit of information overload. Filtering works but takes some getting used to. Time tracking tools are somewhat inconsistent and basic. For be the biggest problems solved are related to quoting and being able to see how long tasks take compared to how they were quoted. Being able to see the breakdown of hours / budget for each task is pretty eye-opening. It's well suited for the types of IT projects we have, both small and large. The capabilities it provides is well positioned with the cost. We can set up projects on fee based and hourly rates by person, which is really nice given we have a mixture of both. It gives us the flexibility needed and has some good tools for Gant Charts, Resourcing, etc. There are a lot of nuances to click to make reports work in the way that you'd like. For example, multiple things must be clicked (billable, hourly rate, etc.) for the billing report to come out correctly but they're not listed as required. You have to figure those things out through trial and error. Also, it would be nice if I could assign people to the overall project and carry that forward to the tasks. However, what we have to do is assign each person over to the individual tasks one by one. This could be simplified to assign in batch. We are an IT consulting firm so this helps us manage projects, pay and billing. "Adele's review of Easy Projects"
The ease and intuitive functionality of the tool. I love that it has many of the elements to do work across functional areas in one uplace. The kan ban boards and resource tracking. I haven't had too much time to use it so there isn't much I don't like other than that the Kanban boards dont move around as easy as I like. We are used to Trello and you do'nt have to open up the task to move it around. See about making the boards more interchangable. We are moving away from a highly customized application of MS Project, this should help facilitate a scalable model moving forward for our teams. "Great tool for efficient communication"
I like that the schedules created are flexible and can adjust when people are running late or ahead of schedule. I also appreciate that it consolidates all of our communication to a central location. There are elements of the user interface and experience that I would like to be more customizable, though I am still exploring all of the system's features. Processes are not always intuitive for our users, so we spend quite some time training our clients on how to use the system. We needed a system that could accommodate our whole team. We have been able to go mostly paperless and have improved our communication with our clients. "A great and easy way to collaborate on projects"
I like that everything is all in one place. All the documents, photos, drafts and communication about the project is all there. I also like that I receive an email when someone makes a comment or updates something. It is a convent way to get notified compared to constantly checking Easy Projects for updates. I dislike when you click "done" on an assigned task that it disappears. I wish I was able to review the work previously summited as a reference. A few times I accidentally clicked "done" on a task I wasn't finished with. Thankfully I was able to communicate with the department utilizing this tool to have them bring the task back for me to be able to review. I also dislike that if I don't click "done" I receive emails saying that it is overdue. It would be helpful if the initiation date of a task and task due date/complete date were more clearly displayed rather than two dates floating by the task. If you are using email to collaborate on projects, stop. Easy Projects is the way to go. It is also user friendly for even people who aren't tech savvy. I am able to easily collaborate with multiple people from the college's design and marketing department to create promotional material for our athletics department. It is a thousand times better than using email for the whole process, which is what we used before. "Simple yet Comprehensive Project Management"
We love the simplicity and functionality of Easy Projects. We are able to run our entire production environment, compliance, quality and costing functions through a single, cost-effective application. There is very little to dislike but would like the ability to plug in other applications, such as GitHub to centralise. As previously stated most areas of our production environment - As a heavily regulated casino games developer it is particularly useful as a timestamp for change and compliance logging but also excellent as a simple to use project management, budgetting and costing tool. Easy Projects is always evolving and improving with new features. It is intuitive. I was able to open it up and start using it without anyone showing me anything. It seems to have many features I do not know about, which is why I titled it "It's me not you". I don't want to say it is Easy Project that can't or doesn't do something just because our company doesn't know how. I dislike not having an assigned person following up with me to be sure it is configured, implemented and adopted as needed for our business. I have had 2 strategic conversations with Steve but follow up with solutions has not happened. I was extremely hopeful something would have come of them. I am now going to start from scratch on my own attempting to learn it and revamp it for how we need to use it. understand the difference between projects and ongoing work before setting it up. Our business is doing projects for clients. So, we use EP for the client projects and issue guest creds/access. We also need to use it for our internal Enterprise projects. Currently, we are only using it as a task tracker and are not benefiting from any kind of project health or portfolio views or reporting insights. "In the search of SINGLE Transparent PM system that meets all the tracking and reporting needs." I use Activity Center and various reports on regular basis and also share reports with guest users. Vacation Calendars are very helpful as well for better resource planning on projects. Ability to comment on a project/activity and send notifications to other team members are another great features. Nothing major that I came across so far! At our organization, we use Replicon to request and approve our colleagues time-offs. I wish there is some integration possible so we can perhaps automatically see the vacation times in Easy Projects without manually entering in the calendar. Easy Projects is very powerful PM system with many great features to meet your PM needs. The biggest benefit for our teams is that to have SINGLE system for all of our projects time, status, updates tracking and reporting! "Excellent, simple, and powerful solution for PM needs"
We researched many options before selecting Easy Projects. It is hard to find a product that is simple to use yet powerful and rich in features. This was the perfect blend of options and simplicity. Users quickly started using this tool and they are loving it. I don't really have a dislike but more of an improvement suggestion. They have some basic APIs but those are not very robust. We wanted to integrate EasyProjects as part of our web authoring tool but we couldn't really do all we wanted. If they improve this, it will be the perfect tool for us. Improve the APIs and make it more open for further development. 4. Excellent way to provide management updates via a dashboard. I like the "Activity Center" Page and how easy it is to customize your own view. I use this everyday to organize my projects, update time logs, view/add notes, update project status, and extend project dates. Easy Projects is very user friendly!! I am not a big fan of the "My Assignments" Page. For me, "Activity Center" is so much easier to use and a one-stop place for all projects. A one-stop place for all project management. Easy to Use and Wonderful Support!! Having all the project details, notes, & messages in one place. Also the cost allocation piece has helped. "Simply the Most Customizable/Capable Project Management Software"
I like all of the features that are built-in as well as the ability to customize it to only show what you want. It means that everyone on the team can view the same project tasks in their own way. Not many other competitor softwares can do that (if any). On top of that, they have always answered my questions and helped me when needed, even spending time to teach me how to use features one-on-one (that was before they had the awesome interactive guides that are built-in now). That there are other software packages out there that pose as "project management" software (really they are task, or glorified task, management softwares aka the Asana's and Basecamp's of the world). In my opinion, those are much more limited and often give project management software, like Easy Projects, a bad rap. Consider why you need project management software and then talk with Easy Projects customer support. If you really need project management, they'll be able to help you. Note that it is an investment for a great payoff, but it is not for the weak of heart. We are managing all of our incoming long-term projects as well as common tasks we do to track the time that we spend in each area. It backs up - or refutes as is more often the case - our intuition surrounding how we spend our time. A bonus has been the built-in forms and auto-conversion feature. It has allowed to create a customer call/e-mail tracking program. We could take it so much further, but have not yet. That is another benefit of Easy Projects - the possibilities of how to make your organization more effective is nearly endless. "Easy Projects has lived up to its name!" I like how it seems to fit with our work process, makes for quick and easy data entry, has the ability to creat custom reports and is flexible for each user. Not a dislike, but I find it a little more work to get the custom reports set up and to capture exactly what we need it to. Our rep is fantastic though and works with us to ensure we are able to figure out work arounds for this purpose. Do your research and you will find that EP is one of the best and most flexible soloutions available. I would (and have) totally recommend EP to companies looking to streamline their project process, records and have the ability to report. Reporting, deadline tracking, transparency in info sharing, and having a catalogue of all projects ever completed within the system at our fingertips. 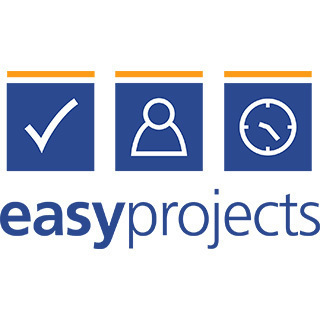 "Easy Projects has the stuff you need"
I like the fact I can track my time and assignments in one easy location. I dislike that the website has an old feel to it, or an old look about it. there is a learning curve for this software, but once you get the hang of it, it works very well. if you need to track time and jobs, this will most likely work for you. we use it to track time for different jobs and employees. being able to see quickly where you are in a project timeline is very useful. "One tool for handling all tasks. Fiction or reality?" EasyProject provides most of the features that can be seen in simmilar products, but many times offers greater customisation that can go very deep (from views to filters, custom roles rules, notifications, custom fields, custom forms). With properly configured projects, assignees and notifications – it’s a lifesaver tool to organize your team’s work. Amount of customisation offers many possibilities, but some of them are still lacking few important ones: few roles options that can be seen in simmilar products are not possible in EP, some UX functionalities that could even speed up the work with the tool (tagging people in comments, hashtags, better overview in project structure what task is opened ) are not present already. We need a tool, that would support internal processes as a place for planning, organizing and executing projects and tasks within one or between more teams. We have already realized, that communication is moving from e-mails to Easy Projects and overview level of what is done is already better than before. "From Enterprise to small business "
Functionality within the site. Fields get erased when entering time and I change the activity or project. one stop for our time entry, project status notes and a way to see exactly where the most time is used/not used. "Very flexible and customisable tool"
Easy creation of projects and task. Many options to set your own filters and views. Custom fields. Guest users. Customisable forms for requesters. Built-in resource management. Following the progress of the tasks and discussions only via email notifications is not very comfortable - notification center would improve the experience a lot. There are other smaller things, such as missing follower or teamleader role, or missing possibility of fixing due date of a task, however every tool we tested had its pros and cons and despite all above, we consider it to be the best solution for us. Collaboration of different teams accross the globe, reporting and resource management. At the moment, we have more than 100 users working with the tool on a daily basis. All conversations and files related to projects are in one place instead of individual mailboxes or other places. "Essential software for running our business"
It's a feature rich software that allows us to manage and track all of our company's projects, as well as keep track of employee timesheets. It's flexible enough so that it always seems to be able to do what we want it to. Can be a little slow to update at times, this obsessionally causes frustrations. We use Easy projects to manage the project plans for over 200 active projects. It not only helps us keep track of project progress and milestones, but also includes metrics to help us keep track of project financial performance. By linking this data to EP's Power BI interface, we can manage all of the company's key performance KPIs. It's also a useful tool for forecasting and estimating project performance..
"Is very organized and easy to use"
That everything is in order. There is no way yo can miss something and the fact that you can leave messages to the people involved makes it faster. "Easy Projects is great for staying organized and communication across departments "
I like that all of my projects are shown on one page and it is easy to see the status of each of them. We are sending much less emails and there is much less confusion between departments. Now everyone is assigned in one place and is updated. "Project management & Customer service in harmony"
The kanban view and the ability to create repeatable task templates are fantastic! Start small and expand as needed. Utilize the project templates! Our department handles graphics, web, & communication projects for every department in the college. Easy projects allows us to easy traffic, complete, & report efficiencies for each of our departments in one system. I love the layout of EZP. It is very user friendly and gets you the information you need in as few clicks as possible. I also love how it automatically saves your data which for people who forget to click the 'save' button (such as myself) is a great backup. sometimes the program freezes. This does not happen often at all, but when it does it's a real pain. It allows me to view budgets and manage them easily. "Easy Projects combines project management along with resource time tracking"
"Does just what the name says: makes project management easy." The customizability - there is a lot of room to make the product do exactly what you want it to do. You can really make it work most for your needs. There may be TOO many options. It can be a bit overwhelming to see all the available ways to personalize the experience. Make sure you take all the onboarding classes and make the most of your time with the onboarding specialists. Managing and communicating with our marketing department - can have a number of team members on one project and everyone can see at a glance what the status is. When you work in an office with a few different locations, this helps to keep everything in one place. I think the minimal amount of steps needed for opening a project is my favorite part of this program. In previous project management programs, there were many repetitive/nonintuitive steps to even begin a project. Which would lead to wasted time. This project management system is more efficient than my previous experiences. I'd prefer if the Budget View included submitted invoices/costs to date (which is the info included in the Business Intelligence section). I would recommend Easy projects to other departments. We're benefiting in that we no longer have two separate programs for budget management and budget. By integrating both needs into one system, our department has been able to save money and keep everything in one localized portal. "Easy Projects is a quick and efficient work delegation tool." The user interface for Easy Projects is very straight forward. Projects, deadlines, notes, and files can all be accessed, edited, and monitored easily. I am not a fan of the fact that each project is stand alone (and perhaps this is just my inexperience with the tool). It would be nice to have task designations assigned under larger projects for organizational purposes. Since the person distributing work has so many people to delegate to and keep track of, Easy Projects offers a nice alternative for managing people. Instead of spending time explaining each task, they are able to assign work and answer questions as necessary which makes everyone's work more efficient. "Clean, intuitive and flexible PPMT"
Configuration is intuitive and boundless. UI/UX is overly text driven. Closing out tasks makes the dependent task change its start date even though the closed tasks has some of its dependent tasks still open. Best value PPMT on the market. Period. We have 60+ NPI projects running concurrently at any given time. EP provide us a window on all activities, status, financials, forecasts, workloads and a myriad of inputs/outputs that can be provided at different levels of end-user requirements. "Sr. Marketing Coordiner - Review of EZP"
The platform is user-friendly and keeps communication in one centralized place. Still learning how to customize settings and search filters. Any training documents that are available would be helpful to share. Additionally, Easy Projects has identified individuals to service our company with real-time web chats to help with questions or issues. While I don't take advantage of it enough, I do think it's a nice perk. Lastly, Easy Projects keeps everyone on schedule. When you are working on multiple projects with multiple team members, this platform keeps communication all in one place and manages the timelines with email reminders. We were previously using a different platform for budgeting and creative development. The creative development portion was not conducive for keeping track of timelines, edits and it didn't allow a space for back and forth communication. Easy Projects combines the two into one and provides a seamless user experience. * We monitor all Easy Projects reviews to prevent fraudulent reviews and keep review quality high. We do not post reviews by company employees or direct competitors. Validated reviews require the user to submit a screenshot of the product containing their user ID, in order to verify a user is an actual user of the product. Hi there! Are you looking to implement a solution like Easy Projects?